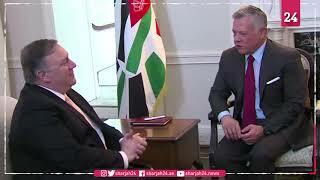 Sharjah 24: King Abdullah II of Jordan met on Monday with US Secretary of State Mike Pompeo, discussing Middle East peace prospects and means to advance Jordanian-US relations. King Abdullah expressed Jordan's appreciation for the support provided by the United States to development projects and programmes. Secretary Pompeo reaffirmed the United States’ keenness to support Jordan, expand cooperation, and continue coordination on various issues. King Abdullah II also expressed appreciation for the United States’ participation in the recent London Initiative Conference, held to support Jordan’s economy.